This tender, fluffy and lightly chewy focaccia topped with a sprinkling of savory za'atar spice is so delicious and so easy to make, you'll want to bake it for every occasion! In a large bowl or bowl of a stand mixer, combine yeast and ½ cup warm water. Let sit 5 minutes until yeast begins to foam. Add remaining 1¼ cups warm water, 2 Tbsp olive oil, flour and salt. Use a wooden spoon or dough hook attachment to stir until a dough forms. On a lightly floured surface, knead dough by hand 5 to 7 minutes, adding more flour as needed until dough is smooth, soft, elastic and only slightly sticky; OR, using dough hook on medium speed, knead dough in stand mixer 3 to 4 minutes, adding more flour as needed until dough is smooth, soft, elastic and only slightly sticky. Pour remaining 2 Tbsp olive oil into a clean large bowl. Shape dough into a ball and place in bowl; turn to coat in oil. Cover bowl with plastic wrap or a tea towel and let rise 1 hour until doubled. Meanwhile, brush a large rimmed baking sheet (about 11 by 17 inches) with olive oil. Punch down risen dough and transfer to baking sheet. Gently press dough evenly into baking sheet all the way to the edges; if it resists (shrinks back), let it sit 5 to 10 minutes, then press again. It may take some patience, but the gluten will eventually relax and the dough will yield and stretch. Cover baking sheet with 2 upside-down cooling racks; top racks with a damp kitchen towel. Let dough rise 30 to 45 minutes until puffy. Heat oven to 450°F. Use fingertips to make indents all over dough. Drizzle dough with olive oil, then sprinkle za'atar spice on top. 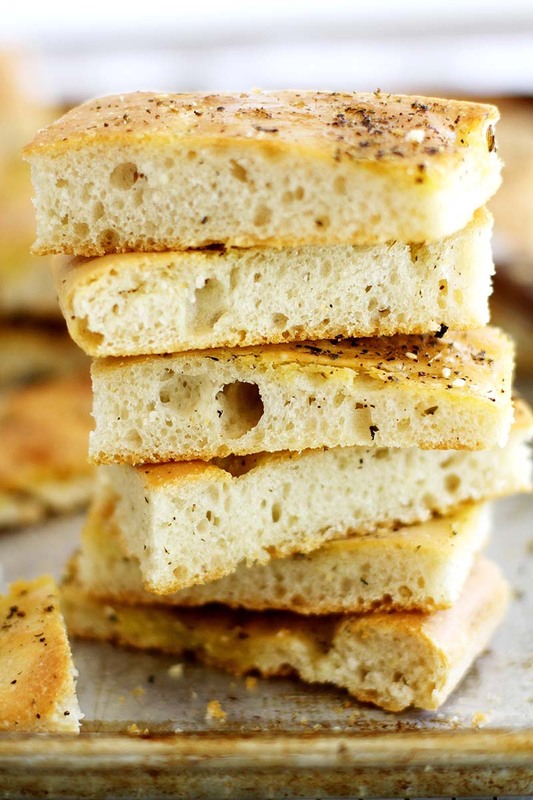 Bake focaccia for 30 minutes until golden brown. Drizzle with more olive oil just before serving.